Monday February 19th 1883 We got the washing done and house all cleaned up before dinner and I was sewing in the afternoon. We all went over to Fletchers to the party and had just a splendid time. Roseberry came tonight. 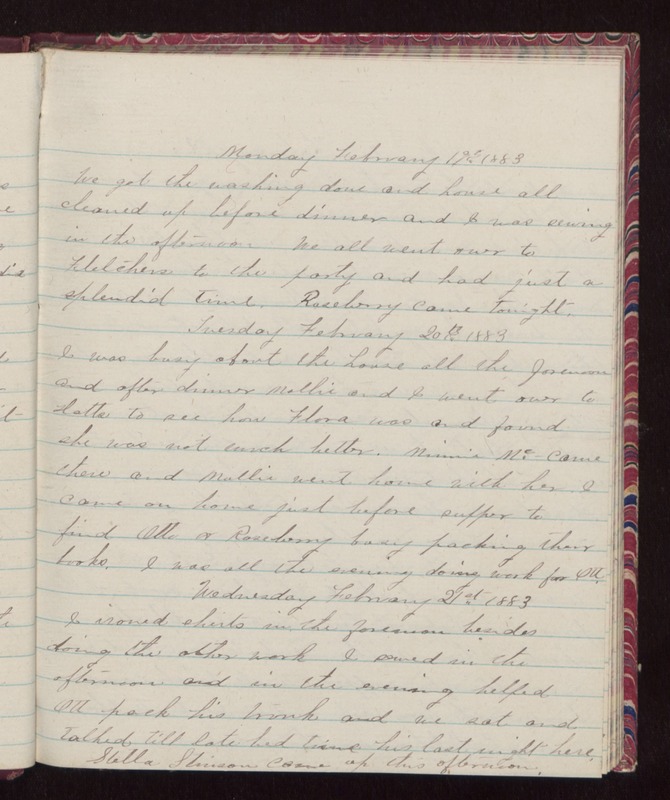 Tuesday February 20th 1883 I was busy about the house all the forenoon and after dinner Mollie and I went over to Hatts to see how Flora was and found she was not much better. Minnie Mc_ came there and Mollie went home with her. I came on home just before supper to find Otto & Roseberry busy packing their books. I was all the evening doing work for Ott. Wednesday February 21st 1883 I ironed shirts in the forenoon besides doing the other work I sewed in the afternoon and in the evening helped Ott pack his trunk and we sat and talked till late bed time. his last night here. Stella Stinson came up this afternoon.